From the Editor: When parents learn that their baby is blind, they usually have a host of questions and very few answers. They may search for weeks or months before they learn about early intervention services and the resources provided by organizations such as the National Federation of the Blind. In this article Ashley Reinhart describes her family's long search for help and its happy outcome. In the summer of 2015 my husband and I sat in a dim, lonely doctor's office. We listened to the diagnosis that our youngest son, Colton, was blind. He would be a Braille reader, and he would use a white cane. We left the office speechless and lost, without so much as a brochure in hand to tell us where to turn next. Immediately I began to search the internet for anything and everything I could find regarding our son's eye condition, Leber's congenital amaurosis (LCA). Even more than medical information, I wanted information about raising a blind child. How would Colton learn? How were we going to teach him to live successfully without sight? We live in rural Minnesota, and resources for children with disabilities are scattered and scarce. I made phone call after phone call, I sent emails, and I waited and waited. Organizations bounced me back and forth. "Not us," they told me, or, "We can't help your son until he's a lot older." Finally I received a return call from Minnesota's Help Me Grow program, which provides early intervention services for children with special needs. I knew right away that this was the program that was going to help us raise a successful blind child. We got our start with early intervention services when Colton was only seven months old, and we built a strong relationship with a great group of teachers and service providers. Terms such as teacher of the visually impaired (TVI), orientation and mobility (O&M), and occupational therapy (OT) are now part of our daily conversations. We seem to talk about the Individualized Family Service Plan (IFSP) and the Individualized Education Plan (IEP) as often as we discuss the weather. It's hard to remember when Brailler, no usable vision, light perception, and dot one sounded mysterious and a little frightening. From the beginning our team has shown incredible dedication and compassion. Our first interaction was with our early childhood education teacher, who was almost like a case manager. She had knowledge about children from birth to age three who have a disability or may need a little extra help. We were so blessed to have her as a part of our team! She went above and beyond the requirements. She even came to our house late one evening to check Colton's hearing after he fell asleep, as he wouldn't tolerate having anything placed in his ears while he was awake. 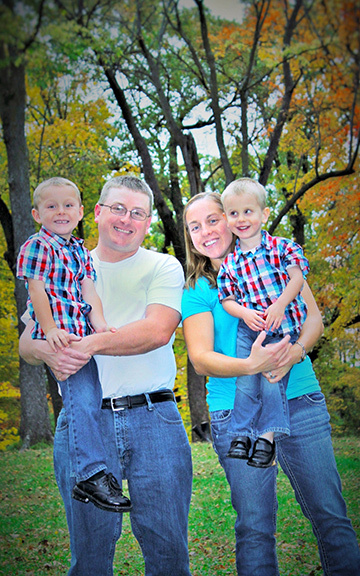 We worked with an occupational therapist for a year, until Colton learned to walk. She always made great suggestions for adaptations we could make. I wished we could keep her on our team, even after Colton had moved on and no longer needed OT services. Our TVI has been incredible in providing Colton's day care, his preschool, and our home with tools for teaching Colton pre-Braille skills and Braille letters. Because of our remote location, Colton's O&M instructor is currently juggling her full-time job as a TVI to contract O&M services for us on Saturdays. She has a two-and-a-half-hour round trip commute to and from our home. Colton has been enrolled at a day care center since he was eight weeks old, even before we knew that he was blind. The center is not specifically set up for children with disabilities, and they have never had a blind child there before. Colton's TVI, O&M instructor, and early childhood education teacher all meet with him at day care to provide direct services and to offer helpful suggestions to the staff. Before Colton transitioned into the next age-level classroom, the TVI conducted a simulation exercise with the staff to help them understand what it is like to be someone without usable vision, an activity that seemed to be very helpful. Colton's current day-care teacher is studying Braille. She hopes to become his Braillist when he enters kindergarten in two years. The key to our partnership and success has always been open communication and a willingness on everyone's part to try new things. Colton's friends at day care view him as just another child in their class. They give him some help when he needs it, but they realize that he is just like most three-year-olds with his "I do it myself" attitude. I had heard and read horror stories about IEPs, and I was nervous when Colton turned three in January 2018. The days of early intervention were over, and we had to put our first IEP into place. No longer would we have the comfort of services provided in our own home. Colton continued in day care and started attending a mainstream preschool one day per week. This change meant he would need to take a bus by himself from day care to preschool and back. To my relief our IEP team made the process very easy and put my worries to rest. Colton's first few months of preschool have gone well, and taking the bus is one of his favorite parts. The special education teacher at the preschool graciously gave up several of her Saturdays so Colton could practice the layout of the cafeteria, restrooms, and classroom prior to attending. Our TVI has partnered closely with the preschool, helping educate the staff; it's been forty years since our public school last had a blind child attend. Colton is thriving. He does not let his lack of vision get in the way of being a happy, carefree three-year-old. He has a great memory and what I think of as an old soul. When you meet him he loves to learn about your family and what you do at work. He may even ask something silly about vacuum cleaners. He can count to one hundred, he knows the print alphabet by touch, and he knows eight letters in Braille so far. He is a whiz at recognizing shapes. Our goal for Colton has always been to keep him as age appropriate as possible. We intend to provide him with adaptations that will help him succeed alongside his peers. Yes, there are still times when meetings and appointments are overwhelming. We know that things may not always go as smoothly as we'd like them to, but I am so thankful that we were able to partner with such an amazing early-intervention team. If only doctors would learn about early-intervention services! At least they could hand a brochure to parents and direct them toward their next steps when they leave the office with a diagnosis of blindness!